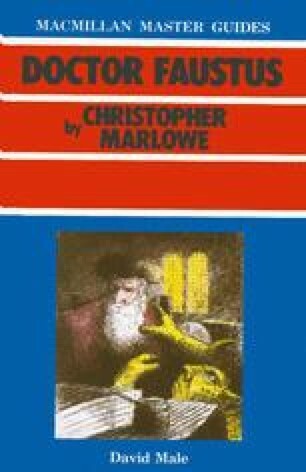 The source material from which Marlowe constructs Doctor Faustus consists of a miscellaneous collection of stories and anecdotes contained in The Damnable Life. Tales about George Faustus stress his long addiction to necromancy rather than his scholarship. He was famed as an itinerant magician wandering through Europe entertaining and amazing all with his marvellous conjurations. Now Marlowe certainly uses several events reported in The Damnable Life in his own play, for instance the conjuration of Mephostophilis, details of the contract with Lucifer, some of the debates, the fun with the Pope, the magical appearance of Alexander, the jokes with the deer horns and the horse dealer, the grapes for the Duchess of Vanholt, the episode with Helen and the horrifying end. But whilst the German narrative emphasises the amazement and the spectacle, Marlowe gives his John Faustus a far more serious, tragic personality. The events are ordered into a careful dramatic pattern created (a) by the Chorus and (b) by the time scheme.